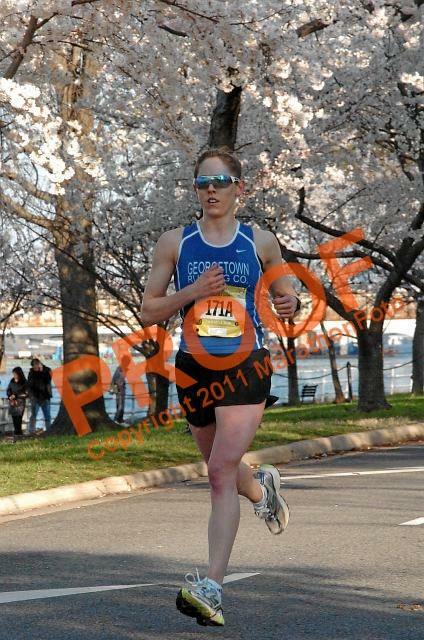 Guest Post: A Pro Triathlete’s Morning Meal Routine! 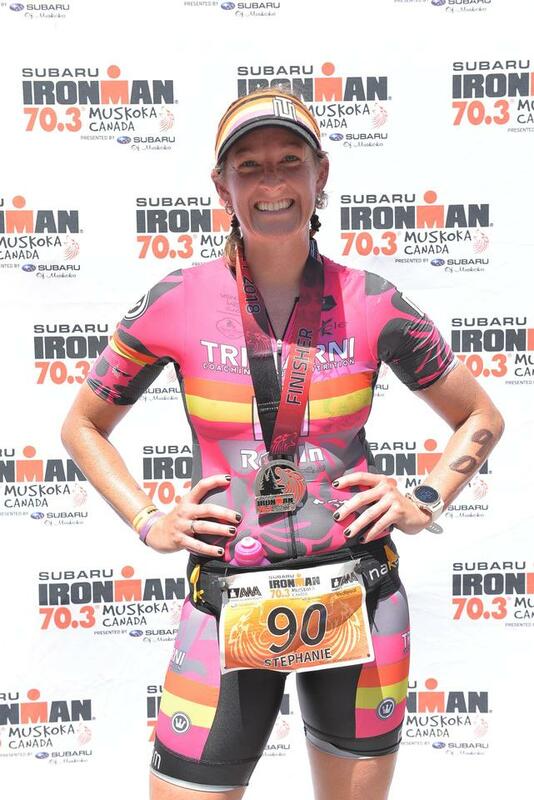 Chloe asked that I share a little about how I balance my meals to fuel training and if I have any tips on eating a balanced diet while working and training to race pro… and maintaining a social life, or simply, sanity. 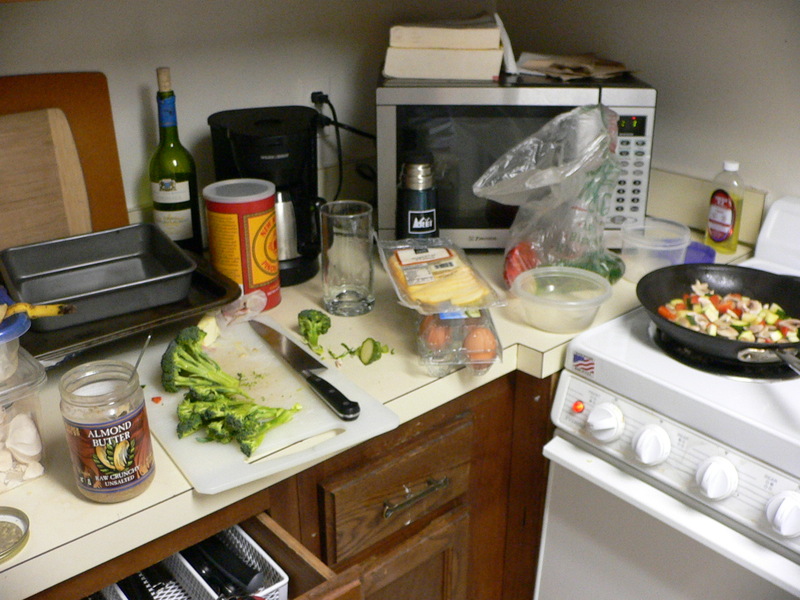 So here is a little insight into my eating routine. How do I eat enough (nutritious) calories to fuel my training? I grew up swimming competitively, so I have always had a big appetite. To combat hunger and make sure that I am eating the right foods to fill me up, I often turn to nut butters (e.g., peanut, almond, cashew, etc.) like many of you. 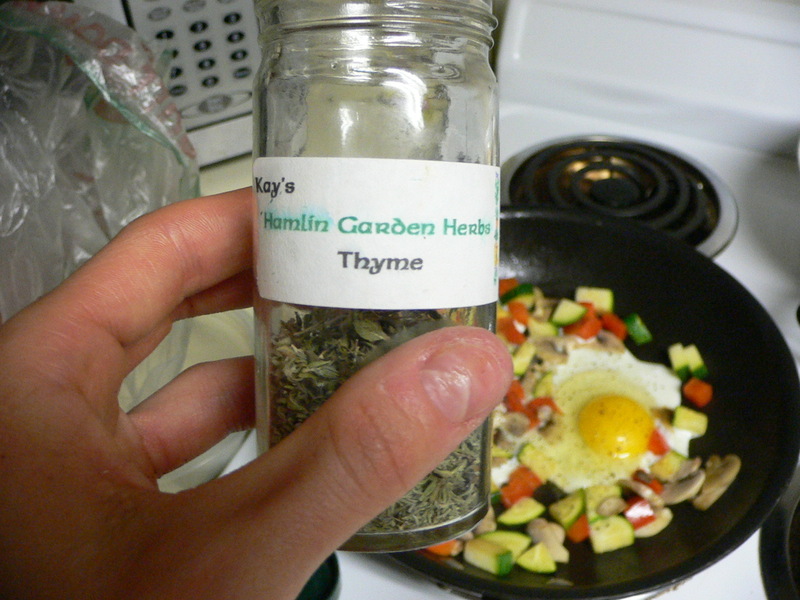 I go through a jar every 5-6 days (which grosses out my roommate, but I’m sticking with it!). Nut butters are high in healthy calories (aka energy). How do I make sure to eat balanced meals while training? In terms of eating balanced, I’ll focus on breakfast, as it is the BEST and longest meal of the day. I consider breakfast to be everything consumed before lunch. First things first: Coffee. 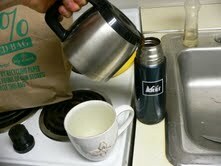 I make a small pot at home and drink half before my morning swim and the other half at work. 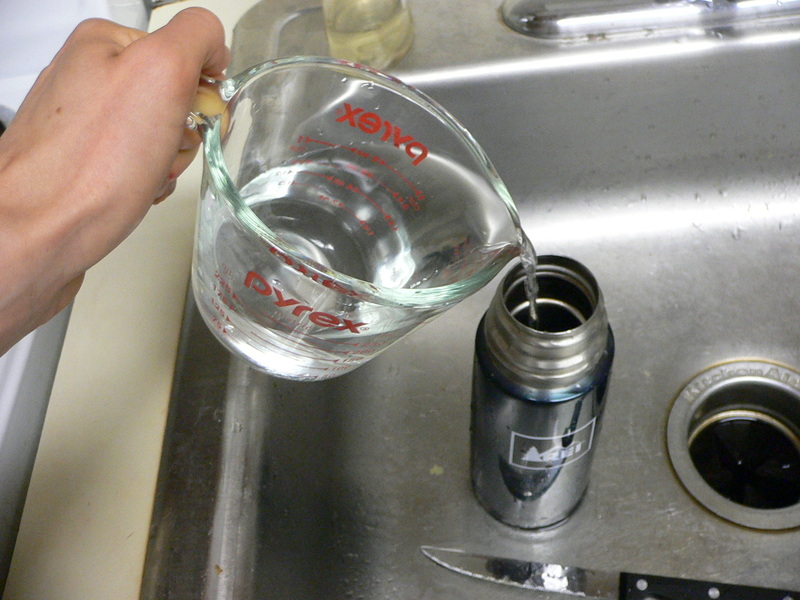 Some might consider this LAME, but–the second half pot goes in a thermos that I take to the office (it keeps during a morning workout!). I think that my homemade coffee is tastier than the office brew and is definitely cheaper than hitting up a coffee place everyday. Pre-workout meal: banana and (too much) nut butter. I haven’t honed the portion control aspect of that yet… I tend to overdo it and promise myself I’ll do better the next day. Post-workout meal: (another) banana or some piece of a snack bar (my favorite is the Chocolate Dipped Coconut Luna Bar! )… something small to hold me over until I get to the office. 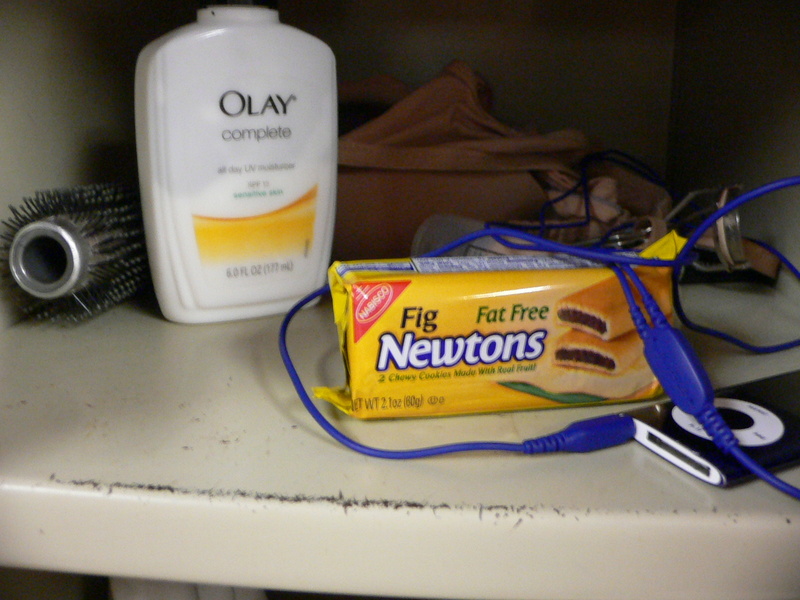 Fig Newtons welcome me back to my locker after a swim! Post Workout meal 2: I love eggs. LOVE eggs. Why wait until the weekend to do a big breakfast right? I make them nearly everyday (seriously) so at some point before I head to the pool, I sautee veggies, throw in 2 eggs, seasoning and cheese… then put it in tupperware. 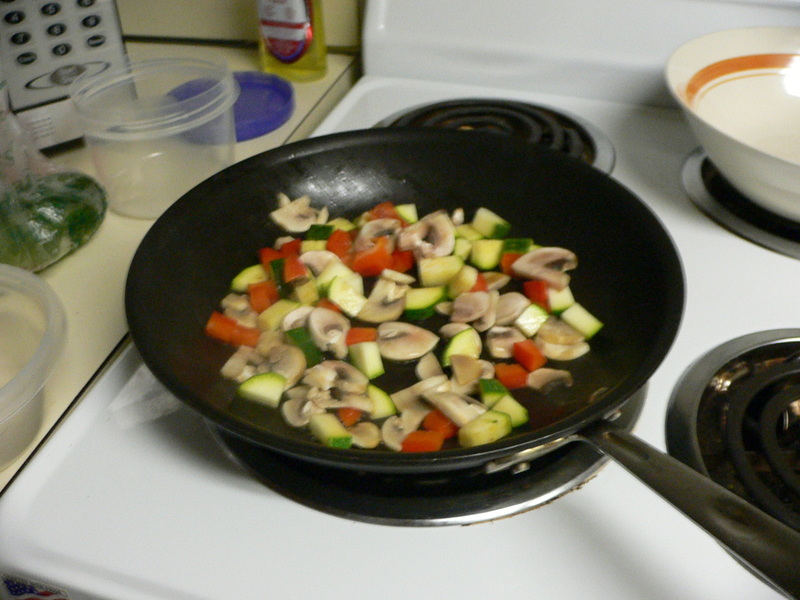 I cook them the morning of or night before–either works. I undercook them slightly so they aren’t overdone when I heat them at the office… note that this method is FAR BETTER than cooking eggs in a microwave, bleh. The eggs would look more appetizing on a dish with a nicely laid fork, but we’re keeping it real people. Time-saving tip – Make several day’s worth of breakfasts ahead of time. 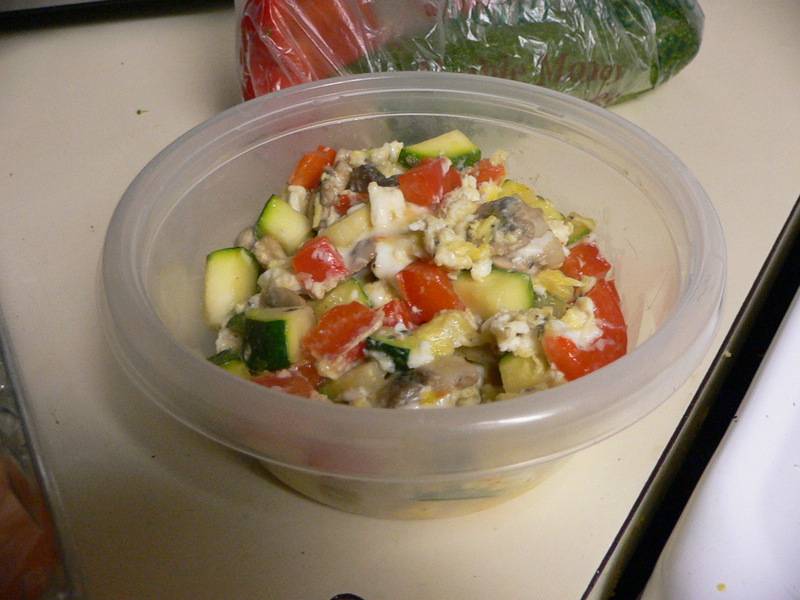 I usually fill a few tupperware containers with my egg saute so that it is ready to go! Oatmeal o’clock meal: between 10:30-11:30 in the morning I conclude breakfast with an oatmeal bomber…Oatmeal + dried fruit + cinnamon + spoonful of cottage cheese for added protein and creaminess. 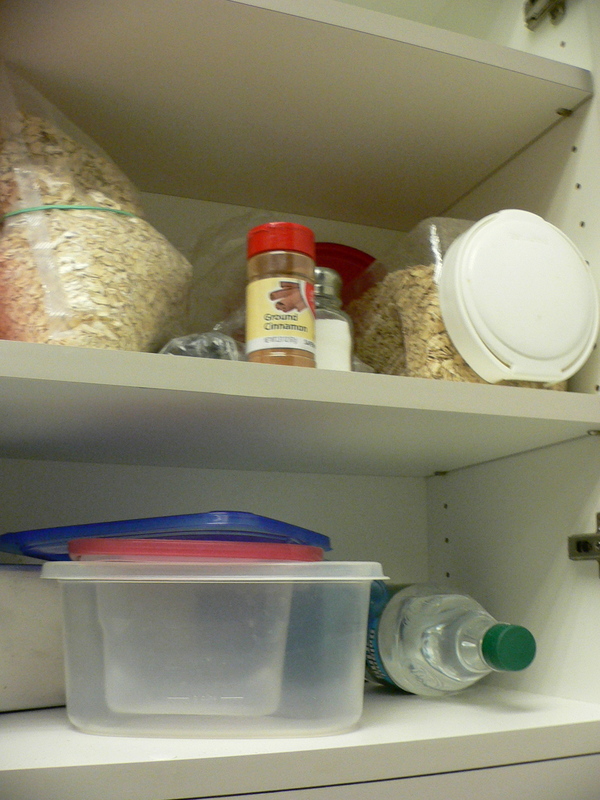 Here’s a pic of the shelf in my office kitchen that I took over to stash my oatmeal. So there you have it! That’s my morning food routine… after lots of trial and error, I figured out which foods worked for me and incorporated them into my everyday routine. Question of the Day: Do you have a healthy breakfast routine you’d like to share? AND, let’s wish Chloe and Steph GOOD LUCK at Kinetic this wkd!! Just found your blog – love it! I found a great breakfast idea that is the right balance for me and keeps me going. 1 cup (old fashioned) oatmeal, 1 tablespoon peanut butter, 1 cup and a bit of dark chocolate almond milk. Microwave for about 2 min. Yummy peanut butter chocolate goodness! oooh i’ve never tried chocolate almond milk! I will definitely have to test it out. Great post! It’s really awesome to hear how a pro does it:). Ugh, work was always the hardest for me, there was always SO much junk food around. Now that I’m in school I’m not tempted as often, but with work it was there all day every day. I would bring my own healthy food, but I have such a sweet tooth that it’s hard to say no–especially all day every day. I used to sit RIGHT next to a lady that kept a well-stocked basket of snickers/kit kats/reeses/etc out for everyone. It was the worst! I would say no the first 502 times I walked by her desk to get from my desk to the printer and back, but it was always that 503 or 504th time that got me;). Gah! me too! oats & pb!